Yesterday was Safer Internet Day and Google decided to celebrate it with the introduction of two new security updates: Password Checkup- a Chrome extension and Cross Account Protection. These new updates help to secure users account detail when using Google products or surfing through your favorite sites from hackers. 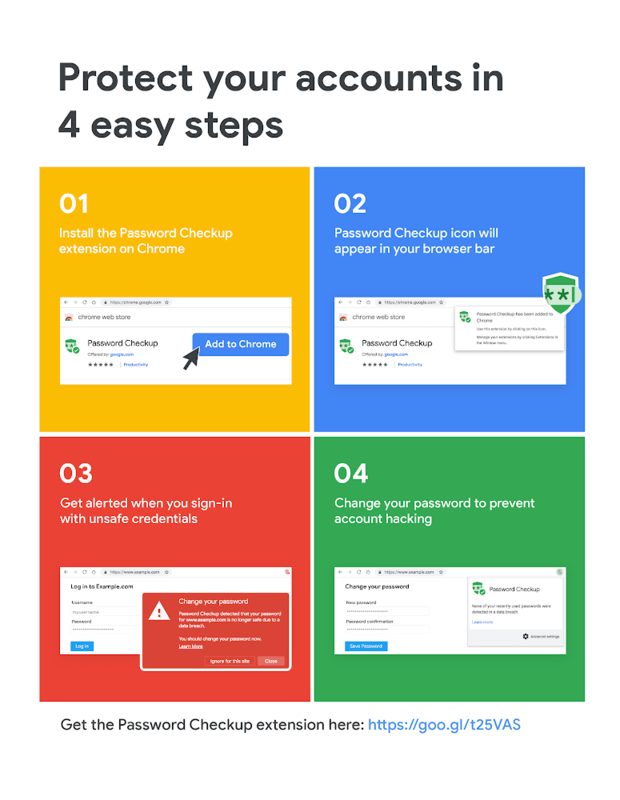 According to Google, the new password Checkup Chrome extension helps to protect your account from hackers by proactively detecting security breach on your account and automatically resetting the password of any compromised account. When Google detects that a username and password on a site you use is one of the 4 billion credentials that they know is compromised, Password Checkup Chrome extension automatically triggers a security warning alert and suggests you change your password. With this Chrome extension, no unauthorized person can know your security details, not even Google. Cross Account Protection helps to secure all the apps you sign into with your Google account which the previous Google useful security tools fail to address. When it is implemented on sites and apps you are Sign into, Google can be able to send information about security alerts—like an account hijacking, for instance—to the sites so they can protect you too. Cross Account Protection was created in partnership with other major technology companies, like Adobe, and the standards community at the Internet Engineering Task Force (IETF) and OpenID Foundation to make this easy for all apps to implement. For app developers using Firebase or Google Cloud Identity for Customers & Partners, it is included by default. Previous articleDo You Know You Can Now Remove Message On The New Facebook Messenger?